Numi Advisory is an expert in hedge fund and equity research recruiting, having advised over 600 clients by providing career coaching, mock interviews, and resume reviews for people seeking jobs in equity research, private equity, investment management, and hedge funds (full bio at the bottom of this article). If you want to know how to pitch a stock, it would be great to have a full stock pitch guide in one article… right? We’ve covered this topic on M&I before, but I wanted to consolidate and update everything and give you real stock pitch examples. The stock pitch matters a lot in hedge fund, asset management, and other buy-side interviews because it is literally what you do on the job, and it’s the best way to set yourself apart. Also, interviewers will ask you to pitch a stock, often multiple times, if you want to get a job at a hedge fund. 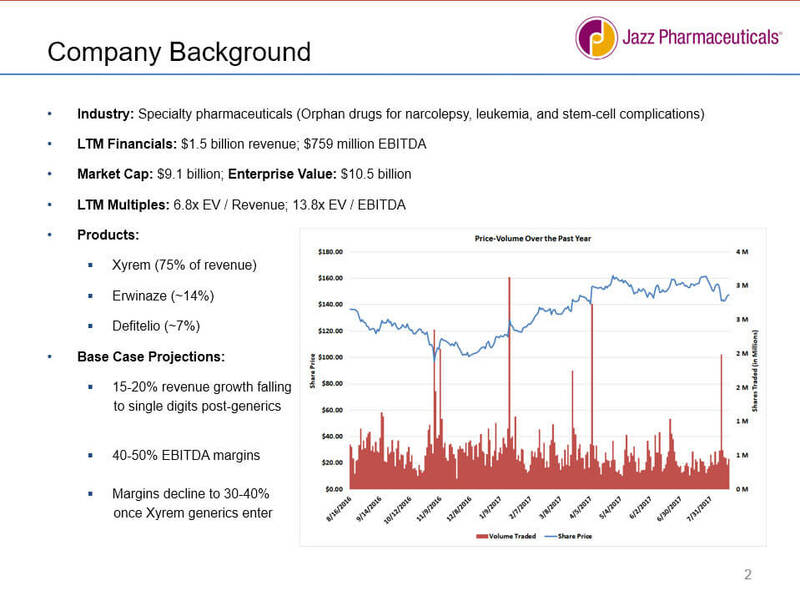 The Jazz stock pitch turned out to be incorrect over a 12-month time frame, but it was correct over a ~6-month time frame when the stock price fell. 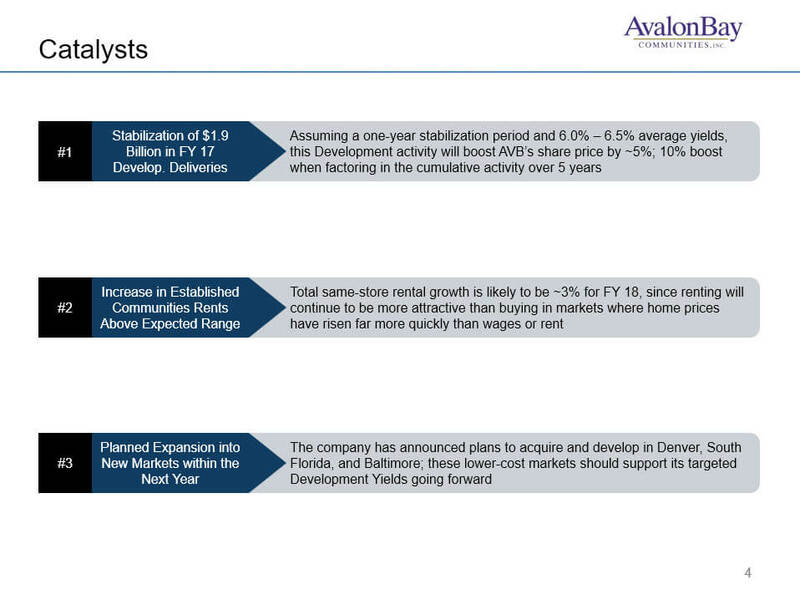 The AvalonBay stock pitch turned out to be correct, with the company returning over 25% (including dividends) compared with an overall S&P gain of ~10% in that time frame. 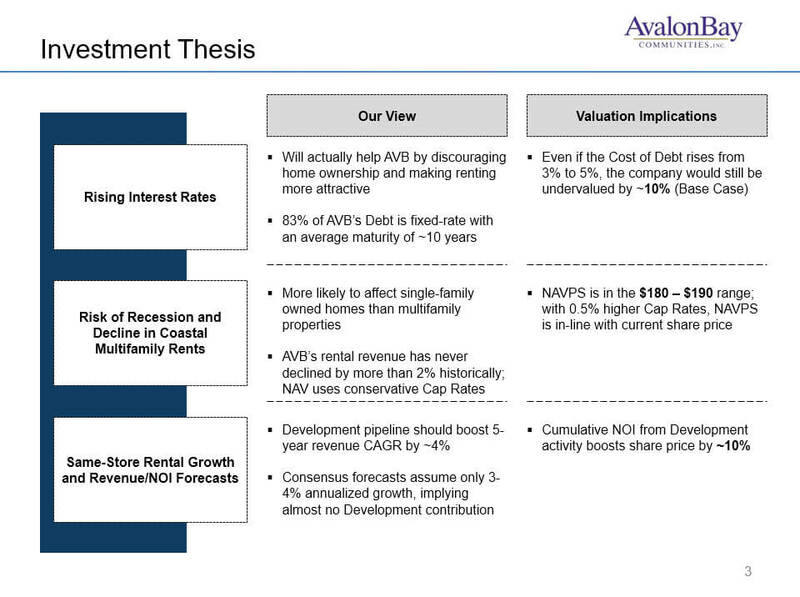 I’m not going to share the full financial models, but you can get a sense of the AVB valuation by looking at our tutorials on REIT NAV Models and REIT Valuation. 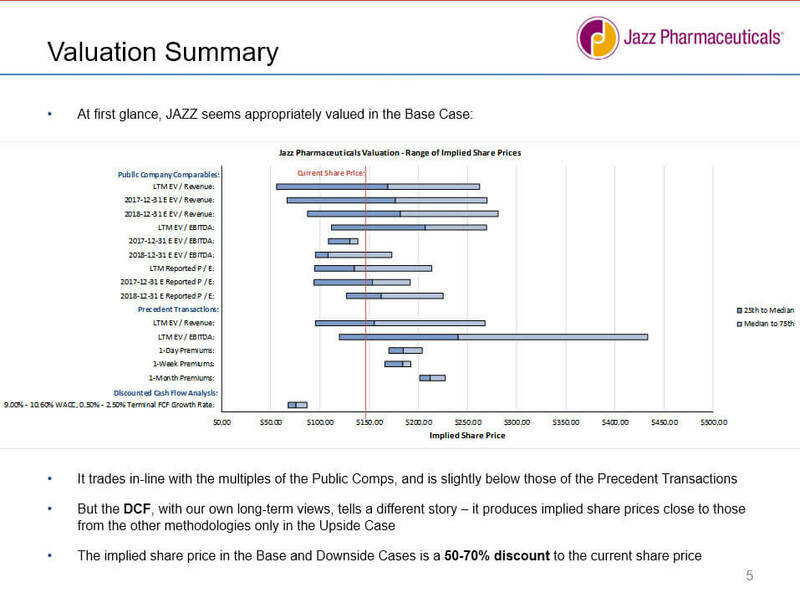 For the Jazz model, take a look at any of the DCF examples in the channel. 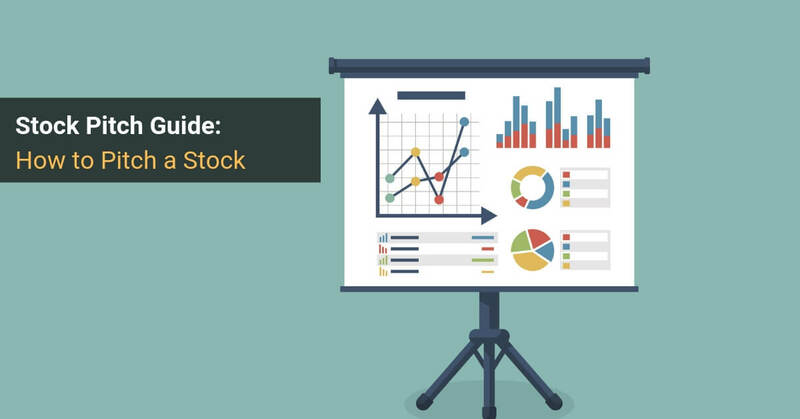 What is a Stock Pitch, and How Do You Use It? Definition: A stock pitch is a short write-up or presentation that argues for or against investing in a public company’s stock, and which is backed by a strong investment thesis, data, valuation metrics, catalysts, and an assessment of the risk factors. Networking: For example, you could look up contact information for hedge fund professionals and include your pitch in your introductory email to them. Interviews: You’ll be asked to pitch a stock all the time in hedge fund and asset management interviews. Investment Clubs and Competitions: You’ll have to present your views, argue why a security is mispriced, and then convince others that you’re right. Personal Investing: If you have a personal trading account and you invest in individual stocks, you can use stock pitches to hone your reasoning and make better picks. On the Job: Finally, if you’re working at a hedge fund or other investment firm, you’ll research and pitch stocks on the job regularly. That is the job! Usually, interviewers, firms, and competition judges won’t give you a specific company to pitch; it’s up to you to do the research and find one. If they do give you a specific company, then it’s probably a time-pressured case study where you have 2, 3, or 4 hours to skim the company’s filings, build a simple model, and make a quick pitch based on that. This article is geared toward longer, “take-home” stock pitches where you have a few days up to a week to finish the pitch, but the basic structure applies to time-pressured pitches as well. If the firm you’re interviewing with does not give you an explicit time limit, ask for it, along with the formatting requirements and anything else they want to see. Finally, note that we are only covering stock pitches here – not credit pitches or distressed debt pitches or global macro pitches involving FX, commodities, or sovereign bonds. You can use the same structure for those, but specific elements of the pitch, such as the valuation, catalysts, and risk factors, will differ. 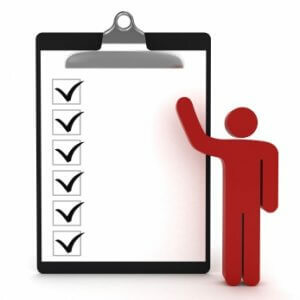 Recommendation – State whether it’s a Long or Short (i.e., whether you think its stock price will increase or decrease) and what the company should be worth. Do not give a “neutral” recommendation unless they assigned the company to you. Company Background – What are the company’s products/services, how much revenue/EBITDA does it generate, what is its market cap, and what are its current valuation multiples? Bonus points for a price/volume graph. Investment Thesis – The stock is priced imperfectly because of these 2-3 key factors. The market has not factored them in because of reasons X and Y. The market is wrong, and there’s a chance to gain significantly by longing/shorting this stock. Catalysts – Certain key events in the next 6-12 months will cause the market to “realize” this pricing imperfection, resulting in a price correction and the potential to make money. Key events might include new product launches, acquisitions, earnings announcements, divestitures, clinical trial results, and financing activities. Valuation – For a Long recommendation, you need to show that the stock is undervalued (e.g., right now it’s trading at $25, but there’s a reasonable chance it’s worth $35-$40); for a Short recommendation, you show why the stock is overvalued. Risk Factors and How to Mitigate Them – You lay out the top 2-3 market and company-specific reasons why your investment thesis might be wrong, and then explain what you can do to mitigate these risks. Even if you’re wrong, could you limit your losses? If this is an initial pitch for networking or interviews, keep it short. “Short” means “2-3 pages at the most,” as in our examples above. Make it longer only if you have a lot of time to present, you’ve been asked to create a slide presentation, or you’ve been asked for a certain number of pages. The blunt truth is that you need to be following industries or companies already to have a good shot of finishing a stock pitch, even a 2-3-page one, in only a few days. If not, then you should reevaluate whether or not you want a career in investing. The best investors do it because they’re passionate about the process itself; pitching stocks is their hobby. So, ideally, you already have in mind companies that are undervalued or overvalued and whose stock prices could change significantly in the next 6-12 months. But let’s say you just found out about an interview in 4-5 days, you have nothing prepared, and you don’t follow specific companies. Fund Strategy: Long/short equity with a growth bias and tech/biotech focus. Good Idea: Short for a recently public tech startup. OK-But-Not-As-Good Idea: Long for an undervalued, mature tech company. Bad Idea: Merger arbitrage pitch for a life insurance company spin-off. Fund Strategy: Value-oriented long-only fund with an industrial/manufacturing focus. Good Idea: Long for an undervalued industrial tools manufacturer. OK-But-Not-As-Good Idea: Long for a misunderstood consumer/retail company amid a turnaround. Bad Idea: Short for an overpriced biotech startup. It’s more important to match the strategy than it is to match the industry. That’s why the “bad ideas” above are strategy mismatches. For example, if you’re an engineer, pick the technology, telecom, or media industries. If you’ve done internships at retail companies, pick consumer/retail. If you like whiskey even more than I do, pick the food & beverage industry. Avoid industries that are highly technical or that have specific accounting/valuation methodologies (e.g., oil & gas or commercial banks) – unless the fund specializes in them. Also, keep in mind that certain industries will match the fund’s strategy more easily than others. You can easily find over-priced and over-hyped tech and biotech startups that are ideal “Short” candidates, but in an industry like chemicals or industrials, it’s easier to find mature, undervalued companies that might be long-term investments. If you don’t have Capital IQ access, the best screening tool is https://finviz.com/. Here’s an example healthcare screen, which you can sort by sector, industry, country, market cap, and other criteria. If the biggest companies in your industry have market caps of $100 billion and the smallest have market caps of $50 million, you should pick something in the middle: maybe the $1 – $10 billion range. If you can screen by revenue, aim for companies with revenue in the hundreds of millions to low billions USD. Do not pick a company with 20 different business lines where each segment depends on different assumptions. Consumer/retail companies are great because revenue depends on the number of stores and the average sales per store, and the projections are straightforward. On the other hand, the maritime/shipping industry is not ideal because you need to make granular assumptions for different types of ships in the fleet. If the company’s Cash Flow Statement is four pages long, or its Income Statement has 13 non-recurring charges, or its Balance Sheet has 30+ items on each side, drop it. Yes, you can simplify and consolidate the statements, but that takes up precious time that you don’t have. If you’re down to 2-3 companies by this point and you can’t decide, pick the one with the most concrete, impactful catalysts. A company that just announced an acquisition or divestiture, a major product or clinical trial results, or a major strategic pivot is a good bet. Product launches and expansion strategies are good catalysts because it’s easy to argue that future growth will be higher or lower than expected. If you’ve done everything above but still can’t decide, pick a company randomly and move on. One final note: do not rely on equity research reports to find companies or investment theses. Equity research is useful for gaining background knowledge and finding market data, but you should not use it for building your investment thesis. Research the Company and Industry – Get the company’s latest annual and interim reports and its most recent investor presentation. You can also search for press releases about the company’s products/services. 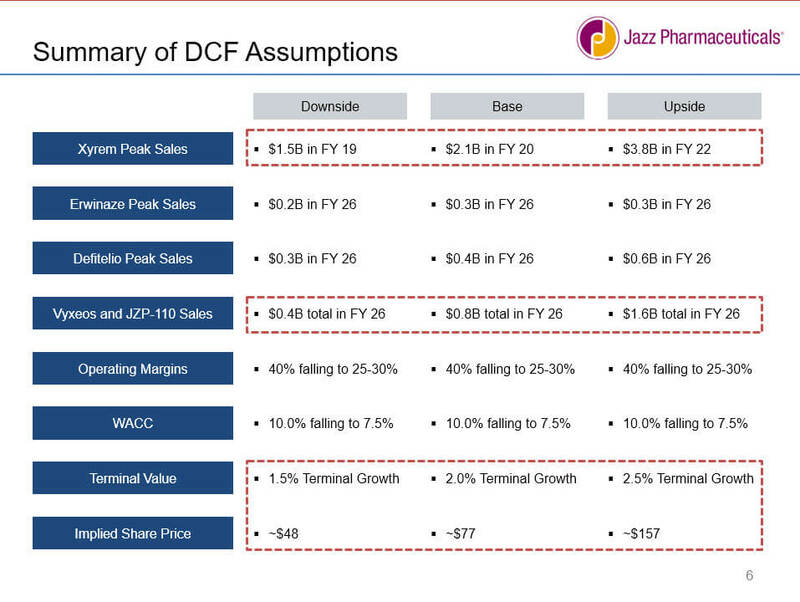 Build a Simple DCF-Based Valuation – You should go beyond percentage growth rate assumptions for revenue and expenses, but you don’t need a 5,000-row spreadsheet, either.Aim to project revenue with Units Sold * Average Selling Price in the main segments, and link the key expenses to Units Sold or the Employee Count. That might result in a DCF that’s around 100-300 rows; a 3-statement model is unnecessary.You’ll need a sense of the Public Comps as well, but you should not spend time scrubbing the data. Use Capital IQ or FactSet if you have them, or Finviz and Google Finance if not. See our tutorial on comparable company analysis for examples. Time Permitting, Do Real-Life Research – If you have the time to do so, spend a few hours speaking with people in real life to find out more about the overall prospects of the company and industry. For example, you could use LinkedIn to look up suppliers, partners, and employees, contact them via email, and ask if they’re willing to speak with you for a few minutes. In exchange, you can explain how investors view their industry. This process is known as a “channel check,” and it’s a great way to set yourself apart with modest effort. A direct quote from a manager at the company’s key supplier is far better than a more complex financial model. Your Angle: How do you see this company differently from the rest of the market? Will it grow more quickly/slowly than expected? Will it be more/less profitable than expected? Will its new products and services perform better/worse than expected? Valuation Inputs: How do these points translate into model assumptions in Excel? Research means nothing unless you can reflect it in your revenue, expense, and cash flow assumptions. Implied Value: What does the output of your valuation look like? Is the company overvalued, undervalued, or valued appropriately right now? How does that change in different cases, such as Base, Upside, and Downside? 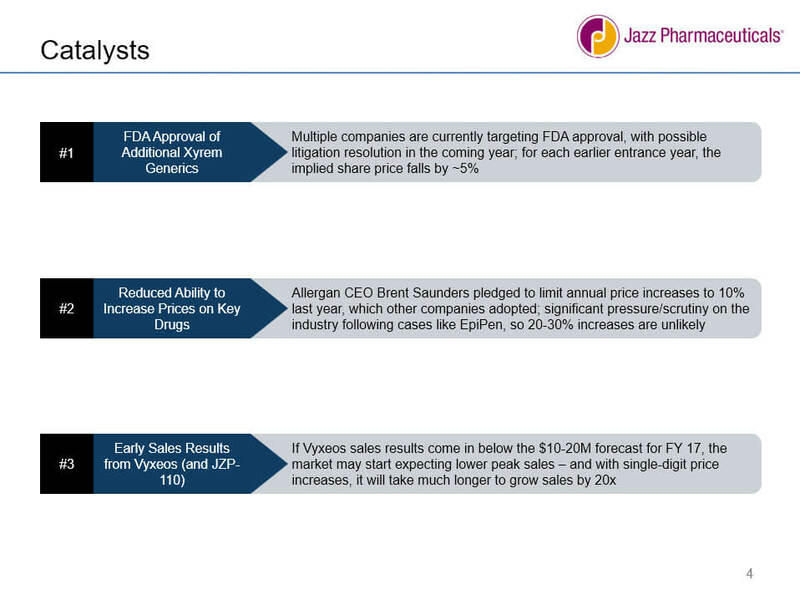 Catalysts: Which 2-3 events or potential events over the next 6-12 months could cause this company’s stock price to change in the direction you predict? Companies can stay mispriced forever if the market doesn’t realize it. 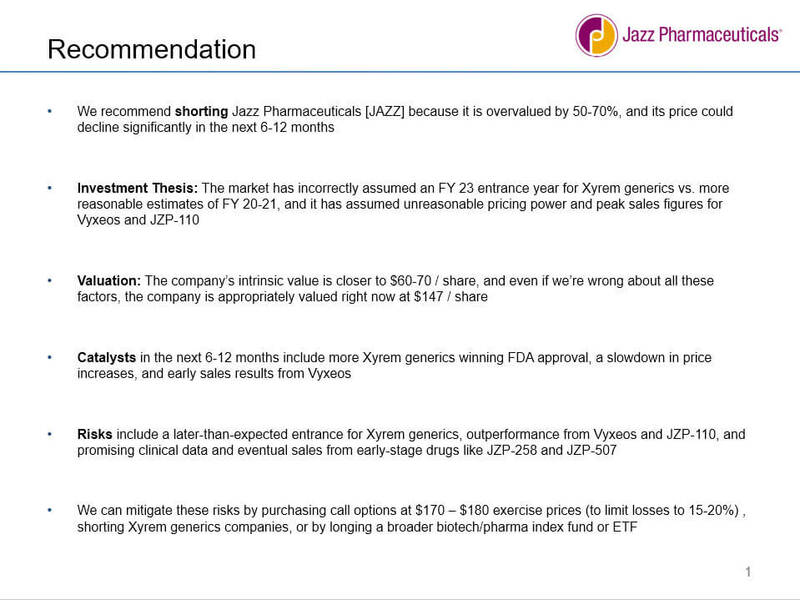 Catalysts are particularly important for “Short” recommendations because they are so dependent on timing. Risk Factors: Why might your recommendation be wrong? 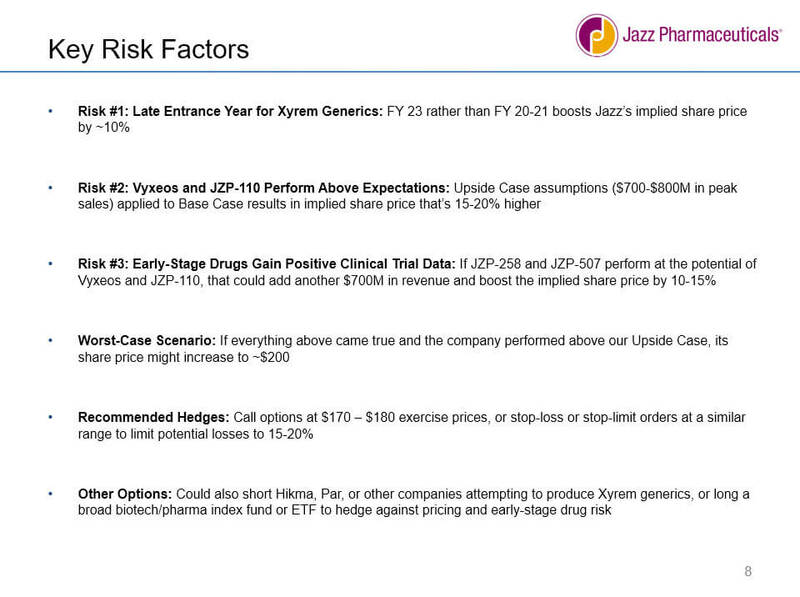 What are the top 2-3 factors that could result in the company’s stock price moving in the other direction? And how could you mitigate these risks? Once you’ve done this, you should be able to create a short, 2-page outline based on your findings. After you have this outline, you’ll expand it to create the full stock pitch. Long or short, current share price, the percentage by which it’s mispriced, and the top 2-3 reasons why the stock price will change in the next 6-12 months. 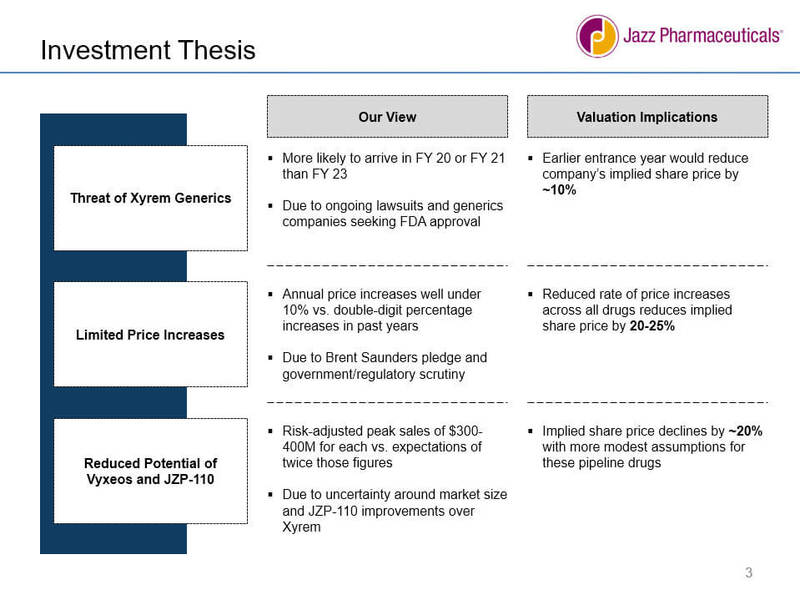 Two or three potential catalysts that will cause the stock price to change in the next 6-12 months. Two or three investment risks (company-specific or market-specific) and how you might mitigate those risks through other investments, call or put options, etc. Longs: Aim to show that the company is modestly undervalued in the Base Case (e.g., 20-30%), dramatically undervalued in the Upside Case (50%+), and only slightly overvalued in the Downside Case (5-10%). Shorts: Show the company is modestly overvalued in the Base Case, only slightly undervalued in the Upside Case, and dramatically overvalued in the Downside Case. You are demonstrating that there’s an asymmetric risk profile, i.e., higher potential gains than potential losses. Here, you list the company’s key financial stats (revenue, EBITDA, market cap, and current multiples) and a quick overview of its business segments and products/services. Don’t just copy in the descriptions from the filings or annual reports – summarize the most important points and leave out the corporate speak. In the Word version, we left out the chart and wrote the bullets in sentences instead. In the investment thesis section, you must point out something that everyone else is missing or misunderstanding about the company. We link each factor to a specific per-share impact on the company’s stock price to show how the misplaced mainstream view is more than theoretical. Besides arguments about pricing and market size, there are many other ways to build an investment thesis. Misunderstood Acquisition or Divestiture: The company’s true upside from a deal will be far higher or lower than expected, and the rest of the market hasn’t yet factored it in because they don’t understand the synergies or integration plan. Lipstick-on-a-Pig Company: The company presents itself as a “SaaS” or “AI” play, but in reality, it’s an overhyped services business that should trade at far lower multiples. Misunderstood Threats: The market expects the competition to beat the company in Areas X and Y, or it expects the company to fail to execute Initiative Z, but it’s wrong for the following reasons. Financial Statement Shenanigans: The company is recognizing revenue too aggressively, exaggerating its reserves, or playing games with capitalized vs. expensed costs, all of which affect its cash flows and, therefore, its valuation. Catalysts should be events or potential events that might occur within the next 6-12 months. Most hedge funds operate on relatively short time frames, so if specific events will not change the company’s stock price for another 3-5 years, the company is a bad pick. Also, it’s much more difficult to predict the impact of events that far into the future. 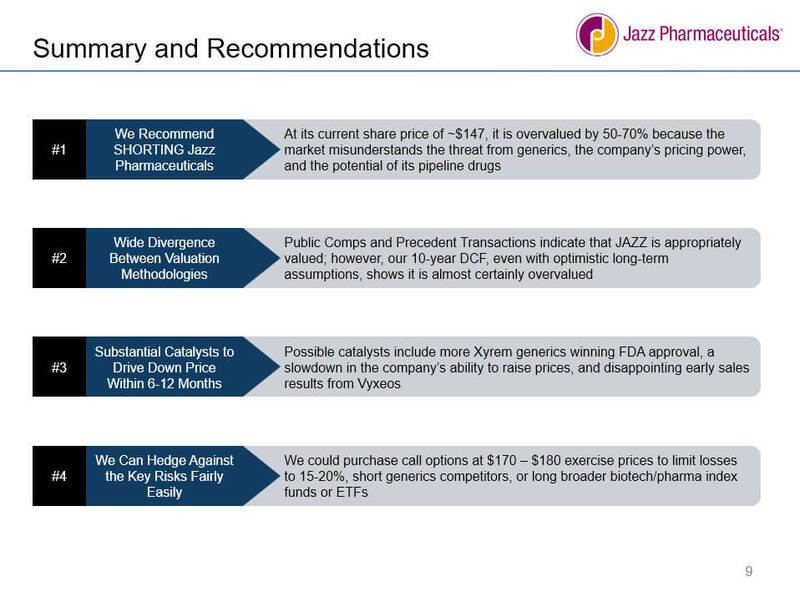 “Hard Catalysts” are events that are definitely going to happen and will produce a specific result: earnings reports, the announced outcome of clinical trials, or the announced acquisition of a smaller company. “Soft Catalysts” are potential events that may or may not happen and where the time frame is less certain, such as a planned international expansion, a change in market share, or the launch of a future competitive product with an unknown release date. Catalysts are most important for Short recommendations because overvalued companies tend to stay overvalued until a specific event, such as an earnings report far below expectations, suddenly makes everyone come to their senses. If a company is high-quality, appropriately valued or undervalued, and has solid growth potential, its share price might increase gradually over time, and specific events are not as essential to your investment thesis. In this section, you must resist the urge to paste in 538 sensitivity tables and instead summarize the output, with a focus on the implied share price in different cases. Focus on the DCF (or DDM, or NAV Model depending on the industry) because it demonstrates your differentiated, long-term views of the company more effectively than the other methodologies. You can support the intrinsic analyses with valuation multiples, but you can’t base your entire argument on them. It’s quite important to include different scenarios, such as Base, Upside, and Downside cases linked to the company’s revenue and expense drivers. If you’ve only looked at a single case in which the company grows by 10% per year, it will be very difficult to answer questions about the risk factors, the worst-case scenario, or the potential losses if your thesis is wrong. In this section, you cross-examine your investment thesis and point out all the flaws and reasons why it might be wrong. The easiest method is to reverse the catalysts: for example, what if the company can raise prices by more/less than expected? Or, what if its new drugs turn into a giant success/failure? What if its clinical trial results are unexpectedly positive/negative? 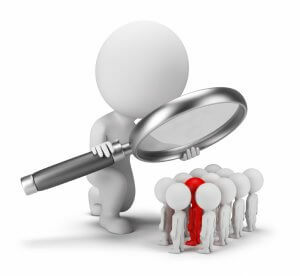 Risk factors must be specific to the company to be effective. So, don’t list “There could be a global recession!” or “Oil prices might plummet!” or “The company might get displaced by robots and AI!” as risk factors. Yes, those are all risks, but they’re general risks that will impact a wide range of companies – not yours alone. You should also write something about how to mitigate these risks. The obvious approach for a Long/Short Equity pitch is to use call or put options, or stop-loss or stop-limit orders to cap your losses at a certain percentage. But you could also recommend longing or shorting other companies’ stocks that might move in the opposite direction, or using other investments to reduce the risk in some way. The worst-case scenario is worth mentioning as well, especially in Long pitches: if the company completely crashes, what might its Balance Sheet be worth in a liquidation scenario? Could it sell non-core assets or other divisions if something catastrophic happens? For Short pitches, what happens if the company’s stock price jumps 200%? How high could it realistically go, based on your valuation, and where would you cap your losses? The presentation of your pitch varies, but if you’re doing it live, expect an extended Q&A session or “healthy debate” after you finish. The investment professionals will dig into your assumptions, question specific numbers, ask about your primary research, and assess how much conviction you have. However, you should make notes about the key numbers, what your different sources said, and the industry stats. And if you don’t know something, you should admit it upfront. Then, offer to look it up and follow up with them after the interview… and make sure you follow through and do that. Even simple valuations have a lot of numbers and assumptions, so there’s a decent chance you won’t be able to remember the source for one specific number. The existing shareholders and how they’ve changed over time. How “crowded” the trade is, i.e., whether or not many other funds have also invested, and the short interest. The stock’s performance over the past few years. The liquidity and average daily trading volume of the stock. How you’ll enter and exit the position without affecting the stock price. If you have the time and resources, and you’re allowed to make a longer pitch, sure, you can include these points. But one problem is that you’ll need Bloomberg access to research these points in-depth, which may not be realistic if you’re a student or not yet in the finance industry. Also, some of these issues are on-the-job considerations – critical when you’re making the trade in real life, but not as essential if you’re presenting the initial idea to generate interest. I’ve reviewed hundreds of case studies, models, stock pitches, and investment recommendations over the years. Unnecessarily Detailed Model – Some candidates spend all their time worrying about minutiae on the financial statements rather than the key drivers. You should create a moderately detailed model (100-300 rows for the DCF) and spend the bulk of your time researching the company, speaking with real people, and honing your investment thesis. Inability to Support the Main Assumptions – Why are you assuming higher revenue growth or margins in a certain year? What historical performance, research, or channel checks support that assumption? Poor or Non-Existent Catalysts – Your catalysts should be short-term (6-12 months), they should represent specific per-share impacts, and 1-2 of them should be “hard” rather than “soft.” Macro catalysts can work, but only if you explain how they will affect your company specifically. Poor or Non-Existent Risk Factors and Mitigants – The most common mistake is to leave out the risk factors altogether, or to give risk factors that are too vague. Many candidates also fail to explain how to mitigate the risks. Lack of Conviction – Many candidates walk in expecting to take the SAT or GMAT and coast through the process, but stock pitches are very, very different. If you are not passionately convinced that your idea is great, it will be very obvious to everyone, and you won’t win the offer. “Practice makes perfect” is a cliché, but it’s also 100% true with stock pitches. To create high-quality stock pitches, you’ll need to practice with at least 2-3 companies before you get a feel for it. And if you don’t yet have a good understanding of accounting and valuation, add on several months to learn those. For interview purposes, you should prepare 2-3 ideas – at least 1 Long and 1 Short – and you can adapt them to different funds as necessary (e.g., you could recommend underweighting your Short pick if you interview at a long-only fund). If you follow this guide, you should have a good start on those first 2-3 pitches. Numi Advisory has provided career coaching, mock interviews, and resume reviews to over 600 clients seeking careers in equity research, private equity, investment management, and hedge funds. With extensive firsthand experience in these fields, Numi offers unparalleled insights on how to ace your interviews, excel on the job, and create and present great stock pitches. Numi customizes solutions to each client’s unique background and career aspirations and helps them find the path of least resistance toward securing their dream careers. He has helped place over 150 candidates in leading buy-side and sell-side jobs. For more information on career services and client testimonials, please contact numi.advisory@gmail.com, or visit Numi’s LinkedIn page.